Wild West World is the second area traveled through in DK: King of Swing. As hinted by its name, it is set in a canyon with cacti, tornadoes, and a mine shaft. The world is home to five different levels, four of which that must be completed to meet the boss, Fire Necky at Fire Necky's Nest. 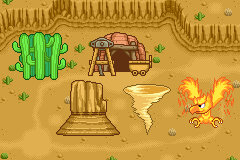 Although set in a canyon, the Wild West World also includes a mine level and a jungle level that is placed around cacti. A level in this world known as Treacherous Twister even contains a vicious tornado that shakes peg boards and blows Donkey or Diddy Kong around if they let go of any pegs. Some new objects are featured in this world, including crates, rocks that can be thrown at enemies, conveyor belts, crumbling pegs, Barrel Cannons, and Booster Barrels. Barrels, moving pegs, and levers also return from the first world, Jungle World. New enemies, such as Zingers, Click-Clacks, and Neckies, also appear in this world, along with Neeks, Flipflaps, Kritters, and Flitters that return from the previous world. This page was last edited on October 10, 2017, at 12:26.